The Martin Kilpatrick Pool Conversion Table Top is the perfect addition to your game room. 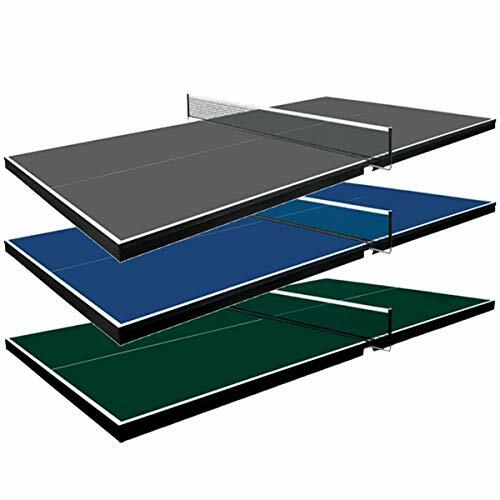 This ¾ inch table tennis top is made in the same factory as Butterfly Table Tennis tables and is designed to fit 8ft pool tables. Rails can be unscrewed and removed to fit some 9ft tables. This table tennis top for pool tables is regulation size, which is 9 ft x 5 ft, making it great for competitive playing for kids or adults. Not only is this great for billiard tables, this ping pong table topper can be used on most sturdy tables, such as a large dining room table. The included foam protection pads are included to prevent scratches to your billiard table. These pads peel and stick underneath the conversion top to protect your pool table from scratches. Converting your billiard table to play ping pong is easy. Place both halves onto your pool table, slide the net posts in each side, slide on the net, and start playing. Unlike most ping pong conversion tops, each half of this conversion top attaches with a dove tail locking system. This locking system prevents separation of your pool table ping pong top during play. Backed by a 3 year warranty, the Martin Kilpatrick Pool Conversion Table Tennis Top ensures exceptional quality as one of the top ping pong table for pool tables on the market. Colors blue, green, and grey are available. Optional 2 player ping pong set is available.